Update: I wrote this post four years ago when I enjoyed using Nadine’s eBook with my best friend’s kids during Holy Week. At the time I had one daughter who was only 6 months old. I am now the happy Mama of three beautiful children; ages 4, 3, and 1 and am looking forward to sharing “The Bunny, The Egg, & The Cross” with them. Nadine has a new blog over at Making Her Mama. In celebration she is generously giving away a copy of her eBook to one of my readers. An Easter teaching book for young children to learn the history and true meaning of Easter. Includes 9 crafts with simple instructions, master supply list, daily teachings and printable scripture cards. Didn’t win? Missed the giveaway? Nadine has generously supplied a coupon code for Pray Species readers that is good until April 16, 2017. The post below details my experience with “The Bunny, The Egg, & The Cross” from four years ago. I look forward to updating this post with pictures from my kids enjoying these activities this year. 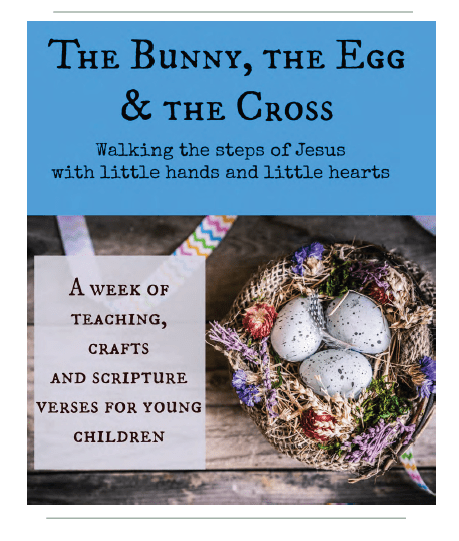 Nadine over at Making Her Mama has created an adorable eBook to help parents teach their children about the true meaning of Easter! Beginning with Palm Sunday, there are daily crafts designed for kids ages 2-6 that are based on Biblical events during Holy week. Each craft is followed by a short devotional to help children reflect on the meaning of Easter. There are also 2 additional crafts focusing on the application of the Easter bunny and Easter eggs to the Easter story. That’s a total of 9 fun, kid friendly crafts! She also includes a master supply list and a list of books perfect to read to children during Easter. Inspired by Truth in the Tinsel, but unable to find a comparable product for celebrating Easter, Nadine created The Bunny, The Egg, & The Cross. The book is very basic, simple, and easy to follow. The crafts require the purchase of a few, inexpensive items, most of which you likely already have around the home. Printable sheet templates and scripture memory cards for the activities are located at the back of the book. The activities are fun and short, capturing the attention span of even the youngest among us. tracing each other’s feet for the clean feet craft for Maundy Thursday. To purchase The Bunny, The Egg, & The Cross, complete with 9 simple, fun crafts and associated devotionals, please visit Making Her Mama. The eBook is available as a pdf printable file for $7.99 and is available just in time for Easter!